I had thought a day or two ago (last year) that I'd have this photo ready and posted as a means of saying goodbye to 2005. As it happens, I did what I too often do and labored too long and with too much self-critical analysis over what would or wouldn't be a good way to present it and now it's nearly the second day of the new year. So much for the original thought. So . . . as a way of ringing in the new year - albeit a bit tardy - I've accepted that simply putting it out there is more than good enough and I'll let it stand or fall on its own. 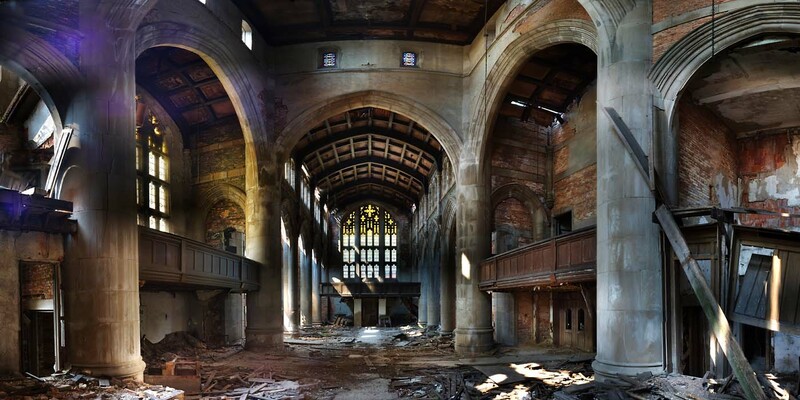 This ''picture'' is the result of stitching together over 100 separate photos taken during the trip Weez and I took with friends Scott and Michelle to City Methodist in Gary, Indiana on the 11th of September, 2005. I learned a day or two after our trip that the church had been marked for demolition in early June of last year. I've checked periodically on the site operated by the local newspaper there and another site devoted to Indiana landmarks to try and learn if that demolition has yet taken place and still don't know. I was trying to come up with a photo from last year that I could post or re-post as my ''Year's Best'' and this one stood out more than any other effort. Not because it's technically perfect or artistically inspired but because more than anything else I did with the camera last year, it represents what I'd like to be able to do every time I press the shutter. For me - the person who will have the first chance to delete or save any shot I take - it captures a sense of scale and wonder and even (again, this is my interpretation) timelessness. That's a lot of what I think truly capable photos should do. That's what I'll keep trying to figure out as the coming year progresses. Happy New Year!